The Thunder, presented by NJM Insurance, are thrilled to share several enhancements at ARM & HAMMER Park for the 2019 season including the addition of a new Picnic Area Bar, CRAFT, and a number of technology upgrades that will add to the fan experience. Located at the end of the third base concourse next to 1911 Smokehouse BBQ and Fitch's Place, CRAFT, will feature 12 total taps with a rotation of seasonal favorites from Lone Eagle Brewing, Rusty Rail Brewing, Flying Monkey Brewing, Nickel Brook Brewing, North Coast Brewing, Bench Brewing, and Wild Tonic brings special kombucha to the ballpark. CRAFT will also feature cans and bottles from Mother Earth Brewing, NJ Beer, Dinkelacker Brewing, Black Bird Cider Works, Steadfast Brewings Gluten-free beer, and cold brew coffee cans from Bomani Cold Brew Coffee. "We're always looking for ways to improve our experience for every fan," said Thunder GM/COO Jeff Hurley. "I believe the additions to our food and beverage operation this year will once again make ARM & HAMMER Park the place to be this summer." This past off-season at ARM & HAMMER Park has also seen the completion of a brand new Point of Sale system. With credit card machines now available at all food and drink locations in the ballpark, fans will see shorter wait times and faster service as they enjoy their refreshments at the game. Fireworks nights continue to be one of the most popular promotions at the ballpark and the Thunder are pleased to welcome all fans for early entry on those nights. For each of the 22 Fireworks Shows scheduled for the 2019 season, all fans will be able to enter the ballpark at 5:30pm and fans of age may participate in a special Happy Hour. Happy Hour specials will be announced on Thunder Social Media channels on the day of the game and will run from 5:30pm until 6:30pm at Killarney's on the Delaware located behind section 211. In addition to the craft beer additions to the ballpark, several additions have been made to the food menu for this season. The Horizon Healthy Plate Stand, presented by Horizon Blue Cross Blue Shield of New Jersey, returns for the 2019 season with several healthy options. New to the menu this season is the Beyond Sausage, a vegan plant-based sausage that gives fans an alternative option to the traditional ballpark hot dog. Dessert is one the most important parts of any visit to the ballpark and fans will love the sweet addition to the menu for this season. Deep Fried Chocolate Covered Cherries will be offered at the dessert stand on the first base side concession stand. Pork Roll Paradise, the top option for any pork roll fan, will expand to the first and third base side concession stands in 2019. Each of the main stands will now offer the Classic Pork Roll sandwich during every game. Pork Roll Fridays at the ballpark will allow fans to purchase $2 Classic Pork Roll Sandwiches at each of the main concession stands and Case's Pork Roll Paradise. A new addition to the pork roll menu for this season is The Little Piggies. An order of three pork roll sliders on a special pretzel bun with a smoky bacon cheddar sauce adds to returning favorites, The Sticky Pig, The Pig Pen, The Hog Steak and The Classic. 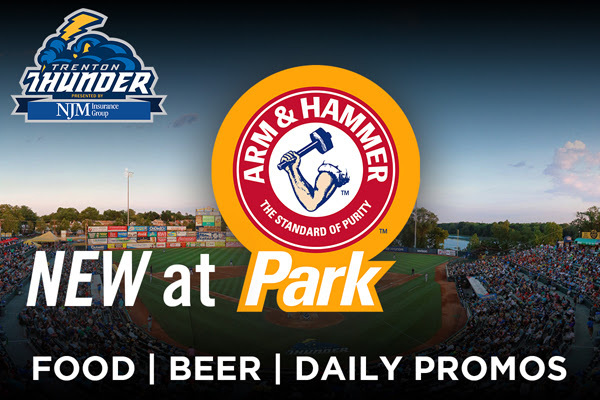 ARM & HAMMER Park will once again be home to special food and drink promotions each night at the ballpark. Tuesday nights are Kids Eat Free, presented by Mompops Natural Ice-pops and Texas Roadhouse, where all fans 12 and under get a voucher for a hot dog, popcorn or Mompop and soda upon entry to the ballpark. Wednesday's are Wine Wednesday's with $3 wine available until the middle of the fifth inning. Thursday's are Thirsty Thursday with $2 draft Bud, Bud Light and Michelob Ultra available and $2.50 bottled Bud, Bud Light and Michelob Ultra until the middle of the fifth inning. Friday's are Pork Roll Friday with $2 Classic Pork Roll Sandwiches and a special on Founder's Brewing at the ballpark. Fans of age can purchase $4 drafts and $5 19.2oz cans on Friday nights. The Thunder will also host a pair of free food nights at the ballpark this season. On Monday, June 10, when the team hosts the Erie SeaWolves at 7pm, all fans can enjoy free hot dogs throughout the game. Sunday, July 21 will be the perfect day to be a kid or a kid-at-heart at ARM & HAMMER Park when all fans can enjoy free soft serve ice cream for the Thunder's 5:00pm game against the Hartford Yard Goats as part of National Ice Cream Day.